The large wheels of a parked tour bus encroach into the bike lane. A moving truck creeps up on my left. Ahead, a police van blocks my way, forcing me into traffic. I feel the sweat down my back. This is my commute to work. And I wouldn’t have it any other way. I get a rush from the immediacy that commuting by bike has to offer. There’s a freedom that a clear bike lane affords that trumps being a motorist in gridlock. There’s also little margin for error. When I navigate that harrowing corridor of big metal objects, I can feel the peril of being the frailest thing on wheels. 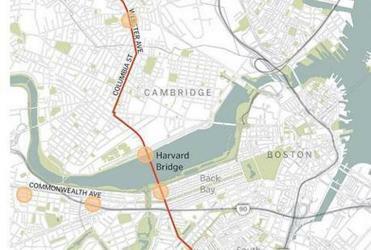 My route takes me through the same busy intersections pegged as the most perilous for cyclists — including the crossroads of Massachusetts Avenue and Beacon Street, where 38-year-old Anita Kurmann was killed Aug 7. 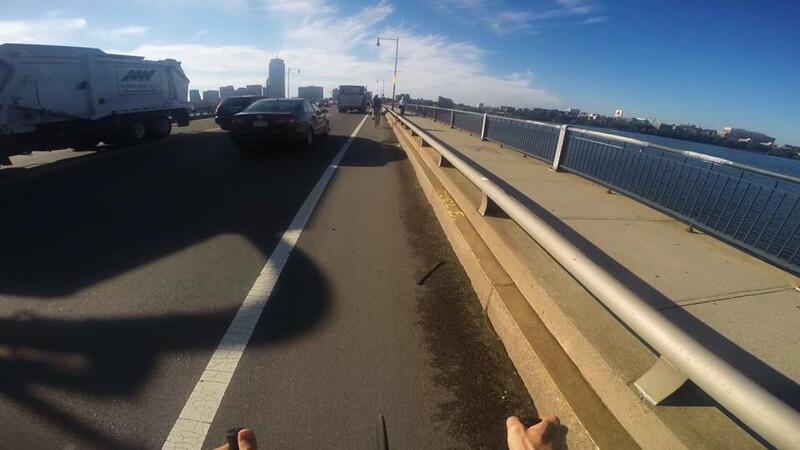 That crash put a glaring spotlight on safety for cyclists and the risks of Boston’s streets. 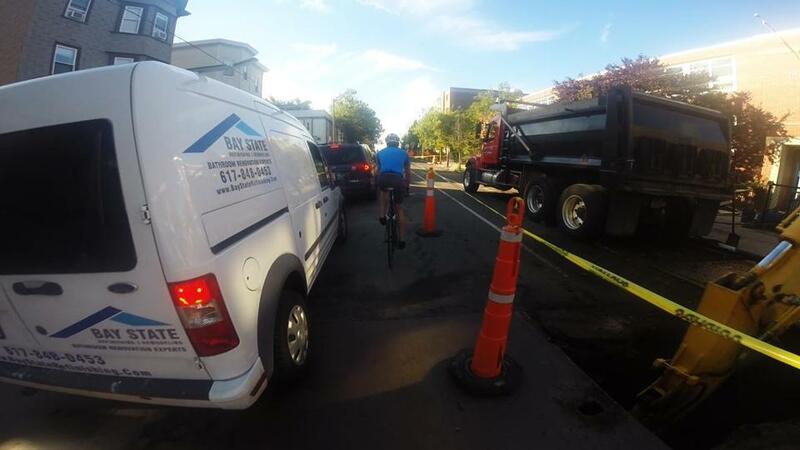 To highlight some of the dangers, as well as the more mundane run-ins faced by cyclists who commute in Boston, I strapped a GoPro to my helmet and brought an audio recorder for my 7-mile morning commute from Somerville to the Globe’s offices in Dorchester. I’ve been lucky. My worst experience on two wheels happened last year,as I was biking home along this route, and a cabdriver making an illegal turn cut me off, causing a crash that left my bike in shambles and my nerves in tatters. But I got back on my steed that week, and every week thereafter. The benefits of cycling outweigh the risks. My commute on Thursday starts off mellow as ever, as sail I through Somerville and into Cambridge. Then I hit Massachusetts Avenue and suddenly I’m hyper-aware. A crane to my right belches out an echoing roar that sounds like the screech of a Tyrannosaurus rex. Orange traffic barriers set up like buoys to guard the work zone force me to squeeze my right elbow against my ribs as I pass through a makeshift lane that files vehicles into a single stream of traffic. Dwarfed by the cars and trucks and that Cretaceous predator of a crane, I start to plan my next maneuver, when the lane reopens and the bike lane reappears. I accidentally drop my voice recorder as I cross some train tracks just past the intersection of Massachusetts Avenue and Albany Street in Cambridge, and its batteries scatter into the road. It underscores the folly of distracted biking. I should really be more careful going over tracks; I have a leaky back tire that could blow. I try not to think about that as I scooch between the tour bus and the moving trucks as I pass MIT. The heat coming from the vehicles envelops me. More sweat. The tension washes away as I approach Harvard Bridge. The marshy smell of the Charles River reminds me of summer camp. The breeze that criss-crosses the span slows me down but allows me to savor the view of the towers in the Back Bay, which jut into the pale blue sky above neat rows of apartments. Harvard Bridge from Cambridge, heading toward Back Bay. But then reality again intrudes on the zen-like moment. Loose rocks kicked up by cars litter the bike lane like tiny land mines. Shards of glass sparkle sinisterly. My elbow stays pinched against my left side. The view is eclipsed by a familiar rectangular shape. It’s that moving truck again, rumbling by. Suddenly I’m in Boston, at the intersection of Beacon and Massachusetts Avenue, where Kurmann died. The spot is unsettling, and is a precursor to the cacophony of whirring vehicles and honking horns; bike-lanes- that-become-sharrows-that-become-bike-lanes again; and daring cyclists who sometimes run through red lights. As the light turns green, I shift from the traffic lane and into a bike lane. I’m met by an uneven surface and gravelly pits of chewed road. Any other morning, a row of cyclists would crowd the lane, but on this day the cycling traffic is light — maybe I left the house at a good time. In some ways, I prefer the solitude. The lane is mine and I can determine my pace. But it also brings back that feeling of frailty. Cycling advocates say that traveling in numbers keeps bike riders more visible and drivers attuned to their presence. I need comrades. From Beacon, a series of green lights let me pass through the Commonwealth Avenue intersection and up toward Newbury Street, before the Boylston Street line. A driver with Florida plates crowds the bike lane, and I grip my brake. After maneuvering around delivery trucks, I make it to Tremont Street and prepare myself for the last leg of my commute, passing beneath Boston Medical Center, where the bike lanes vanish and the roads become choppy. As I approach Dorchester, I encounter moments, again, where I’m squished between trucks and drivers to my left. On Columbia, a cyclist coming the wrong way down the street, right into me, gives me a death glare. I let it pass. I emerge at Kosciuszko Circle , the rotary notorious for its congested traffic, where I get a clear shot. I pump my legs so I can soar through an opening in traffic. A driver in a delivery truck lets me go ahead of him, and make the right-hand turn that takes me down toward Star Market, just before the Globe’s offices on Morrissey Boulevard. He shouts from his truck. “We’re not that bad,” he says, alluding to the tension often felt between drivers and cyclists. I hope he thinks the same of cyclists. At a red light up ahead, I thank him, and tell him I’m a reporter. He looks at the camera strapped to my helmet and laughs. We bump fists and away we go. The chaos is behind me — until I bike home. 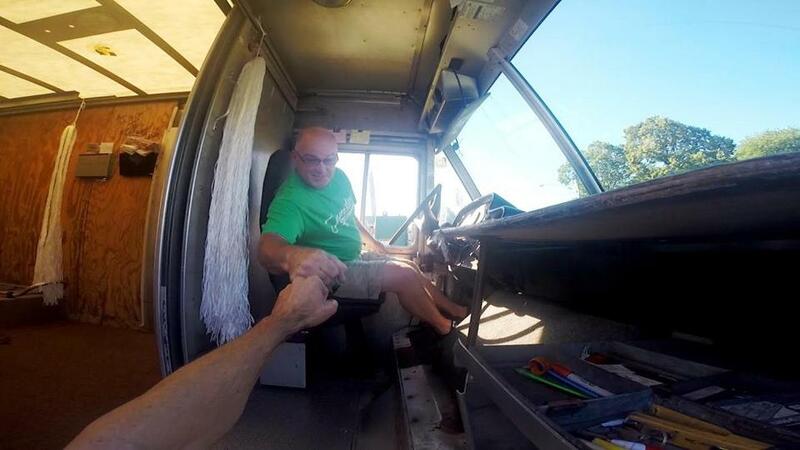 Reporter Steve Annear shared a fist bump with a delivery truck driver.